Account presents a visual analysis of society's tendency to project its belief systems onto its environments. 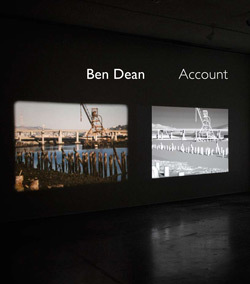 To produce the work, Ben Dean filmed three locations whose architecture, landscape, and history are representative of different attitudes towards urban redevelopment in the San Francisco Bay Area. The films were then reconstituted, frame by frame, as photorealistic computer-generated animations. When displayed, the film and the animation are projected side-by-side, perfectly synchronized using a system that Dean invented. The experience of viewing this installation may at first seem to revolve around an appreciation of the technical facility by which Dean has produced his digital reconstruction of the film, a process that took nearly five years. However, it is the sites themselves, and the stories embedded within them, that are Dean's main interest. Latent visual evidence within the architecture and landscape at each site alludes to a series of utopian ideologies and urban realities that have led to proud and sometimes brutal modifications to the local terrain. Dean calls attention to these details through an extensive series of omissions and adjustments to his animated scenes. Tracking these alterations requires an aggressively active mode of attention, as the viewer must attempt to watch the juxtaposed images comparatively—a challenging process that requires constant readjustment of the gaze between the two projections, as they in turn pass relentlessly from one scene to the next. Account opens onto a view of Islais Landing Waterfront Park. Problems in this area date back to San Francisco's first burst of growth during the Gold Rush, when the creek began to be used as a sewage channel. For decades, the area was a dumping ground for the city's slaughterhouses, before rehabilitation efforts brought in a series of successively less unsavory industries and a gradual improvement of the devastated landscape. The history of Islais Creek runs parallel to the history of a growing environmental consciousness in San Francisco and other parts of the nation. By the mid-1980s a coalition of community groups and non-profit agencies had begun a push to transform the area into a waterfront park—a task that was finally completed in 1998. The most obvious alteration to Account's animated scenes is the universal exclusion of vegetation. This absence is most thoroughly evident in the scenes of Islais Landing, where the tangled clusters of native brush that partially obscure the scene's central building appear to have been cleared away, revealing in their stead (and actually present at the site) a rack of kayaks, pleasant in their arrangement. It is also here that Dean made his most intrusive adjustments to the digital scene, replacing the assortment of parked vehicles visible in the film with the boxy yet gently curving shape of a single sight-seeing bus. The resulting tableau, most readily viewable in the panoramic print produced to accompany the installation, can be viewed as a clear array of evidence suggesting the site's past and present circumstances: the shambled pilings that once supported Islais Street during the period's dirtier, slaughterhouse past; the warehouse and small shell building typical of simple redevelopments several decades ago; the five-story "copra crane," used by the local coconut processing plant until the 1970s and now a designated historical landmark; and the kayaks, bus, picnic table, and other indicators of the area's recent grassroots transformation into a public park and recreation area, lending a feel-good vibe to the eradication of the rivers of sewage, blood, and other industrial carnage that once populated the area and which, as in most cities, has since been diverted or relocated to less evident and remote locales. That carnage, of course, is both the price and the picture of progress, and by the end of the nineteenth century the rapid growth of urban populations had created a frightening accumulation of filth, crime, and social unrest in many of the nation's largest cities. The expansion of cities often led to the development of massive new city plans that aimed not only to channel supplies and waste into and out of urban centers, but, in its most utopian incarnations, to create glorious series of parks, monuments, and municipal buildings that, it was hoped, would actually elevate public morals by engulfing the citizenry in environments that embodied the highest ideals and the greatest achievements of humankind. At the turn of the century, those ideals and achievements included a breathtaking ability to conquer and tame the landscape, remaking the world in Man's Anglo-Saxon image. Conveniently, many new city plans also required razing the very slums whose inhabitants were to benefit from this new urban vision. The second section of Account presents the interior rotunda of San Francisco City Hall, an awesomely scaled Beaux-Arts structure that features one of the largest domes in the world. The digital reconstruction of this space stops short of depicting the elaborate scrollwork and sculptural ornamentation gracing the walls and banisters of the rotunda. Instead, it focuses on the equally ornamental program of geometry that frames those decorations, its regularized forms serving to augment and articulate the building's vast array of surfaces. Scrutinizing these stripped-down forms, one notes another of Dean's common adjustments: the source and direction of light within the animation does not always match that within the film. This is most evident towards the end of the City Hall section, when the interior of the dome appears suffused with a brilliant and symbolic light, a beacon at the western edge of empire now emanating the higher power it was built to summon. And while it remains unclear whether City Hall's majestic design elevates the morals of those subject to city rule, the rule of law is followed by the artist, who declined to catapult his camera across the space, a humorous flourish that concludes the first and third sections of the film. In the City Hall section, however, the film goes dark at this moment, and the viewer is left to watch the launch approximated within the animation, the simulation here perfecting what could not be accomplished in reality. The utopian aspirations of City Hall find their most profitable heir in Pacific Shores Center, featured in the third and final section of Account. Touted as the largest mixed-use development ever built in a single phase in the United States, Pacific Shores Center was sold at the end of 2006 for approximately $825 million, roughly $325 million more than the cost to build it. Marketing literature for the site describes it as "a next generation work environment, designed to facilitate productivity, satisfaction, and balance for industry leading companies and their employees." It is mega-development which, like City Hall, assumes that the properly conceived environment can elevate a citizenry. In this case, however, it is a more refined capitalist value (higher productivity) rather than a broader category of civil obedience at stake, and the Pacific Shores structures almost appear as if fragments from the geometry of City Hall's decorative program have been enlarged to the scale of a building's entire facade. Taking a lesson from disputes at Islais Creek, the entire development was also designed to be ecologically friendly, and the project involved restoring 135 acres of wetlands and integrating hiking trails as well as extensive fitness facilities into the campus, catering to both the political and the sporty sensibilities of the tech-industry employees to which it aims to be landlord. Pacific Shores presents a landscape where the digital world appears ascendant. The glass walls of the corporate complex are rendered opaque in the animation, capturing deeper shadows that make the buildings seem more solid than their filmed counterpart. It is an apt reversal, since the animation was produced using the same type of software that was likely used to create architectural renderings of the complex before it was built. Many of the tenants at Pacific Shores are businesses known for producing some of the most complex and realistic digital animations in the world—companies that are ushering forward a new era of image-making that will define our perception of reality in coming decades. Indeed, the virtual reality of computer-generated imagery is an inheritor to the dominating spirit of previous eras, as it allows its makers total control to create and modify their world to perfection. It is not lost on Dean that he uses those same tools to create his analyses in Account, and it is something for which he offers no apology. After all, the intellectual force of Account does not ride on its hyper-controlled and seamless digital landscapes, but within its humble method of juxtaposing two projections, and the active, engaged mode of looking that can be elicited as a result. It is a type of looking that developed most productively during a golden era of experimental cinema in the 1960s and 1970s, and which grew in concert with one of the most turbulent and radical political periods in U.S. history. Within the abstracted and minimal avant-garde productions of that era dwelt a belief that an active and engaged mode of looking would naturally become a politically aware and activist mode of being. That assumption is the fourth utopia examined within Account, and one for which Dean offers no corollary in the landscape. Rather, it is a hypothesis that remains to be tested by the viewer, alive by its very means of being discovered. Glenn Phillips is Senior Project Specialist and Consulting Curator in the Department of Contemporary Programs and Research at the Getty Research Institute.